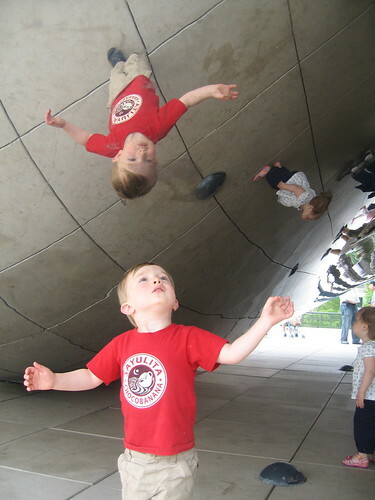 finn at the "bean" in millennium park, originally uploaded by lisabagg. "Daddy, if I keep growing, will my head hit the ceiling?" Every summer since I can remember, my high school friends (those who can make it--we miss you, Annie!) usually meet here in Chicago. That included me back when I lived in San Francisco, and "us" when Shawn joined the picture. Those weekends usually involved drunken badminton, well-intentioned grilling, and someone usually "napping" in the lawn, oblivious to the surrounding festivities. Oh, and lots of beer. This year, Danny flew in from L.A.; Nick, Lisa, and the kids from Cleveland; and the unpronounceable--but irreplacable--Dave Czneriawski drove in from The Cleve, too. We've been easing into this for a while now, but this year was noticably different. And I really think we owe it to the shorties. Instead of revolving around our own hedonistic whims, activities centered around picnics, the zoo, and wholesome barbecues. We were actually all in bed early--and that does not include the aforementioned "naps." Don't get me wrong, there was still plenty of beer. Just earlier nights, a grateful thing for those of us who are pregnant. Here are the (family-friendly) photos. Finn and I made our first trip out to the beautiful Field Museum to see the Dinosaurs. REAL dinosaurs! Saturday was a lovely day, so Finn and I picked up Delilah and headed for the petting zoo. Finn loves this farm, and he loves Delilah, so the combination of the two was almost two much. He actually gave a victorious fist-pump arm gesture when I told him our plans. And then, we we picked up Lilah, he was like, "Lilah! There are goats there! And piggies. And zebras! [ED: There are no zebras.] And a train. Want to hold hands?" Here are the two petting some pretty sweet goats (which are not unlike Santos in their temperament) and waiting for the choo-choo ride. IMG_5871.JPG, originally uploaded by lisabagg. If this photo isn't a ringing endorsement for the delicious bakery where Shawn got my birthday cake, I don't know what is. 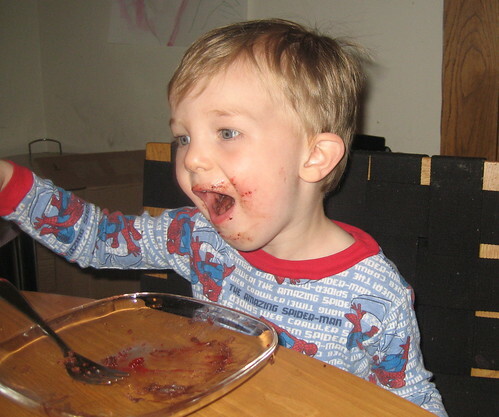 The "awwww yeeeaaahhhh" face, the empty plate, the exuberant chocolate smears on his face and on Spiderman jammies. They all tell a tale of a cake that was enjoyed. And you should have seen me! Since I've been pregnant, I've had to give up all my guilty pleasures, like riding mechanical bulls, skydiving, and whiskey shots. This decadent cake filled the void. peterSutherland, originally uploaded by lisabagg. A belated, but heartfelt welcome to little Peter Sutherland, Katy and Paul's third sweet baby. This little guy looks *so* much to me like his adorable big sisters. I just know that he is going to be cuddled and loved and babied like only a baby brother with two big sisters can. Congratulations, guys! 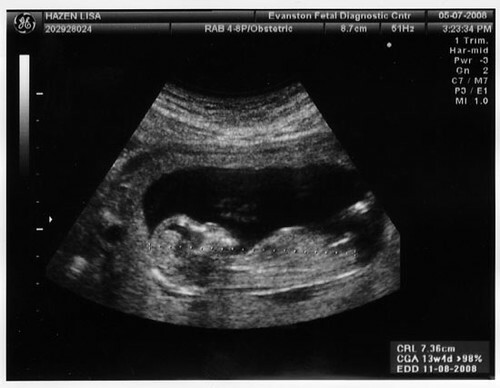 ultrasound, originally uploaded by lisabagg. You were only half right, because yes, I am getting tubby, but I'm also currently three months pregnant. The baby is due in November, and we are all thrilled. I had to wait to tell you, Dear Internet, because we needed to make sure this was a healthy baby before we got you all excited. I hope you understand. Now that we're safely emerging from the first trimester, we told Finn last night that he's going to be a big brother. His three favorite neighborhood friends—Delilah, Ella, and Sammy—all have new babies in their families, and for months, he has been asking us if he can have a baby of his own. When making his case, he promised that he will share his toys, his food, and show the baby how to play "mountain" with the beanbags in the basement. 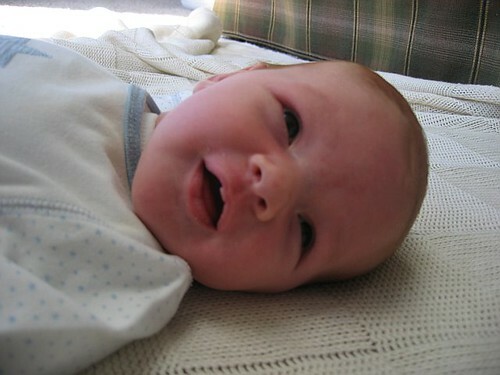 Last night, he patted my tummy before bed and said, "Hello, baby! I'm your big brother. If you cry, I will bring you milk. Tell me when you want to play!" It's going to rock his world, but at the same time, I think he's going to be a great big brother. IMG_0056, originally uploaded by lisabagg. .... is SUPER grubby. 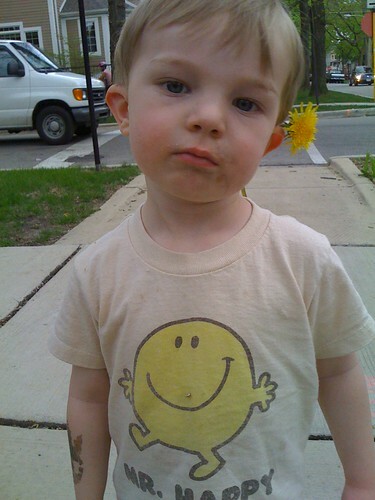 But I do like the dandelion behind his ear. photo, originally uploaded by lisabagg. Longtime Baggermaniac, Cari Linden (a friend of mine from both high school and college) was in town this weekend, visiting some family. It was delightful to catch up with her Sunday afternoon over a bowl of gelato in Bucktown—it has seriously been probably about eight years since we've seen each other. It's so great when you see an old friend and it's like no time has passed at all. Especially when said friend knew you back in the days when you had a perm. There's a lot of ground to cover right there. On Sunday, Katie and Omar had our neighborhood friends over for margaritas (the parents) and juice (the kiddies), and some other good eats. It was a very rainy, cold Saturday afternoon, and believe me, when Finn got up from his nap, you didn't have to ask me twice for an opportunity to get together with friends. When Finn arrived, his first stop was at the food table. Finn demonstrated his love for all things edible by devouring: guacamole, chips, hot dogs, strawberries, crackers, cookies, and then a chocolate cupcake. These magical chocolate cupcakes that Lisa brought seemed to unleash the silly in all of the kids, as evidenced by these shots. Here are all the two/three year olds piled into a chair as I tried to pose them for a photo. Looking at this list will leave no question as to why the blog has languished lately. LHD&E is busier than ever, and now sometimes works with the services of a certain Hazen Creative, which has its office upstairs. The guy who works there is totally cute. The biggest thing I was working on the past two months was the redesign of Pilates-Pro. This site was one of my first projects when I started my business two years ago. The Pilates Pros wanted to take the site from being primiarly a blog to being more like a dynamic online magazine for Pilates professionals. We started by migrating all the old blog content to its new design, and formatted it appropriately to work well in its new home. We added a job board, a community discussion board, shopping section, and more. I'm really pleased with how it turned out. The Pros announced the launch with an email newsletter I designed, as well. I also designed a site for Priya Arts, a new company that is producing a CD/DVD series that reproduces selected verses from the Bhagavad Gita in song. This was a short and sweet job for a lovely project. My article on ways designers can cultivate their creativity is now on newsstands in the April, 2008 issue of HOW magazine. I got the cover story on this one (yay! )and really learned a lot writing it. For this article, I interviewed the most excellent Scott Belsky of Behance. As a past editor of HOW, I know that it's difficult to find fresh ideas in this area. But Scott had such original, practical advice. You can read it here. And this week, I just submitted another article for HOW on how to use your Web site as a self-promotional tool. For this, I interviewed another fabulous source, Eric Holter of Newfangled Web Factory. I learned so much writing this story--Eric provided great advice on everything from the importance of designing your site for search engine optimization to the importance of developing a strong content strategy before design starts. I will post this on my portfolio site shortly. Lastly, The Red Room invited me to be one of their featured authors on their site. I'm right up there with company like Maya Angelou, Salman Rushdie, and Barack Obama. This site is a hub for writers and the readers who love them. They provide the opportunity to connect with writers, and participate as part of their community. There's also a great bit of original content offered by the authors. I'm honored to be a part of it! Phew! More soon. More Finn, that is.